Mathematically inspired, optical illusion-creating Dutch artist M.C. Escher would have celebrated a birthday on Wednesday, June 17. In honor of Escher, The Huffington Post decided it was time to reignite the debate over one of his most famous illusions. The above video, created by YouTube user mcwolles, depicts a real-life version of the Dutch artist's 1961 lithograph "Waterfall." Just as in Escher's version, it appears that the water breaks the principle of conservation of energy as it recirculates with water flowing upward and defying gravity. 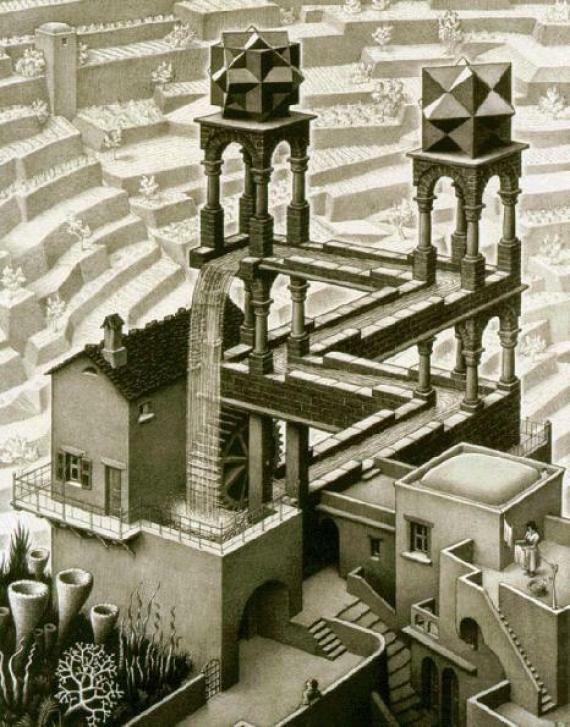 Obviously, with a name like "Waterfall," it's pretty clear that the water is traveling down at some point in Escher's work. But if this were to exist in real life, how does the water flow upward to eventually return to the bottom? Escher's optical illusion is created by the use of something called an impossible figure, in this case stacking two "tribars" on top of each other to mess with your perception of visual depth. The top of each tribar -- where the water first falls over the side and where it's in front of the "second level" -- are both simultaneously the closest point to the viewer and logically the furthest point, given the construction of the waterway. So as the structure of Escher's recirculation machine is logically impossible, the water is actually flowing both up and down. How about the mcwolles machine? If you want to know how the video's creator pulled off Escher's impossible creation in real life -- along with giving up on a world where life can imitate art and the impossible is possible -- you can head to his followup video and a further explainer to find out. Is the water flowing up or down?